The other original influence on the design of online teaching has come from military training and distance education. Figure 4.3.1 The ADDIE model. 4.3.2 Where is ADDIE used? This is a design model used by many professional instructional designers for technology-based teaching. ADDIE has been almost a standard for professionally developed, high quality distance education programs, whether print-based or online. It is also heavily used in corporate e-learning and training. There are many variations on this model (my favourite is ‘PADDIE’, where planning and/or preparation are added at the start). The model is mainly applied on an iterative basis, with evaluation leading to re-analysis and further design and development modifications. One reason for the widespread use of the ADDIE model is that it is extremely valuable for large and complex teaching designs. ADDIE’s roots go back to the Second World War and derive from system design, which was developed to manage the hugely complex Normandy landings. Many open universities, such as the U.K. Open University and the OU of the Netherlands, Athabasca University and Thompson Rivers Open University in Canada, have and still do make heavy use of ADDIE to manage the design of complex multi-media distance education courses. When the U.K. OU opened in 1971 with an initial intake of 20,000, it used radio, television, specially designed printed modules, text books, reproduced research articles in the form of selected readings that were mailed to students, and regional study groups, with teams of often 20 academics, media producers and technology support staff developing courses, and with delivery and learner support provided by an army of regional tutors and senior counsellors. Creating and delivering its first courses within two years of receiving its charter would have been impossible without a systematic instructional design, and in 2014, with over 200,000 students, the OU was still using a strong instructional design model. Although ADDIE and instructional design in general originated in the USA, the U.K. Open University’s success in developing high quality learning materials influenced many more institutions that were offering distance education on a much smaller scale to adopt the ADDIE model, if in a more modest way, typically with a single instructor working with an instructional designer. As distance education courses became increasingly developed as online courses, the ADDIE model continued, and is now being used by instructional designers in many institutions for the re-design of large lecture classes, hybrid learning, and for fully online courses. 4.4.3 What are the benefits of ADDIE? One reason it has been so successful is that it is heavily associated with good quality design, with clear learning objectives, carefully structured content, controlled workloads for faculty and students, integrated media, relevant student activities, and assessment strongly tied to desired learning outcomes. Although these good design principles can be applied with or without the ADDIE model, ADDIE is a model that allows these design principles to be identified and implemented on a systematic and thorough basis. It is also a very useful management tool, allowing for the design and development of large numbers of courses to a standard high quality. 4.4.5 What are the limitations of ADDIE? A second criticism is that the ADDIE model is what might be called ‘front-end loaded’ in that it focuses heavily on content design and development, but does not pay as much attention to the interaction between instructors and students during course delivery. Thus it has been criticised by constructivists for not paying enough attention to learner-instructor interaction, and for privileging more behaviourist approaches to teaching. Another criticism is that while the five stages are reasonably well described in most descriptions of the model, the model does not provide guidance on how to make decisions within that framework. For instance, it does not provide guidelines or procedures for deciding how to choose between different technologies, or what assessment strategies to use. Instructors have to go beyond the ADDIE framework to make these decisions. My main criticism though is that the model is too inflexible for the digital age. How does a teacher respond to rapidly developing new content, new technologies or apps being launched on a daily basis, to a constantly changing student base? Although the ADDIE model has served us well in the past, and provides a good foundation for designing teaching and learning, it can be too pre-determined, linear and inflexible to handle more volatile learning contexts. I will discuss more flexible models for design in Section 4.7. 1. Take a course you are currently offering. How many of the stages of the ADDIE model did you go through? If you missed out on some of the stages, do you think the course would have been better if you had included these stages? Given the amount of work needed to work through each of the stages, do you think the results would be worth the effort? 2. 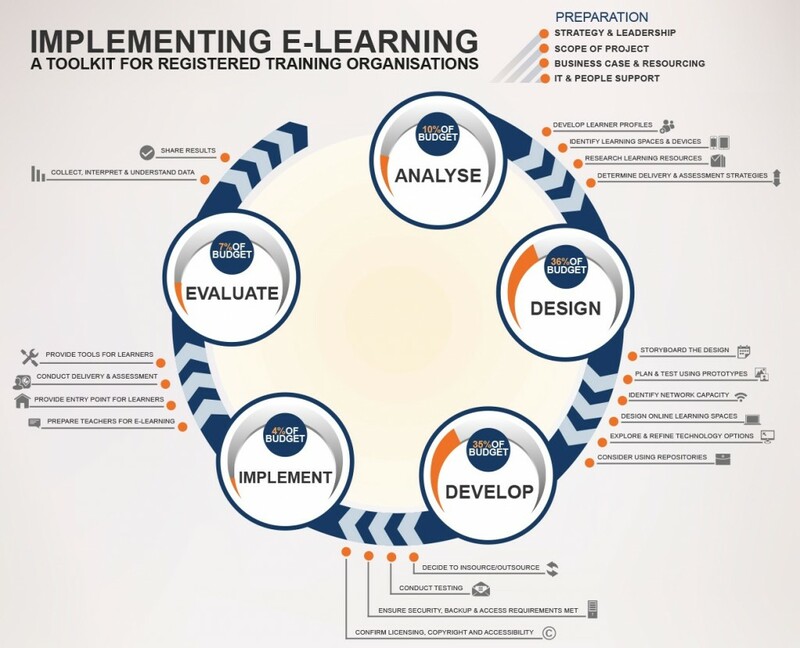 If you are thinking of designing a new course, use the Flexible Learning Australia infographic to work through the four steps of analysis they recommend (it is probably best to log in to the infographic directly). Was this helpful? If so, you might want to continue with the other recommended steps. 3. If you have previously used the ADDIE model, are you happy with it? Do you agree with my criticisms? Is it flexible enough for the context in which you are working? 4.3 The ADDIE model by Anthony William (Tony) Bates is licensed under a Creative Commons Attribution-NonCommercial 4.0 International License, except where otherwise noted.